Struggling to forget a past of lies and fleeing from himself, Cristophe Marchand crosses the seas as a soldier in Napoleon Bonaparte's army. Once the French imperial expeditions are over, Cristophe becomes a corsair, a shipwreck victim, a westerner adopted by natives and a husband to a young woman from the tribe. Later, he returns to his village to work in the biscuit business he started out in when he was a child. But the eternal hatred of Alexandre Basset will not let up and Cristophe must face up to his past with the woman he never forgot and the rising of a hungry people seeking justice. In Napoleon's France, a young man will become the voice of his people, and will rise up to defend the honour of a nation. 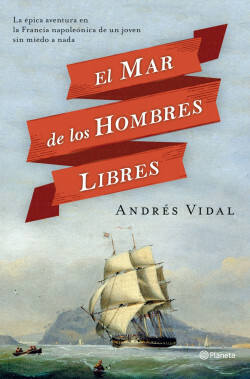 Andrés Vidal once more hits the mark with his “trademark ingredients”: exhaustive documentation, passionate characters and plenty of action. An epic adventure novel that hops between genres: historical and adventure novels, told with a skilful, entertaining, and addictive text with all the hallmarks of a bestseller. Real characters appear in the novel, such as Napoleon, Robespierre, etc. which lend colour and realism to an age full of great names. The world of pirates is fascinating; their lives were real-life adventure films.